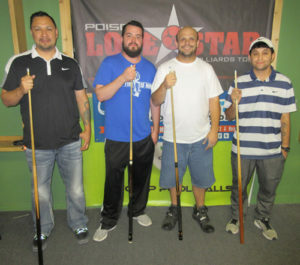 Round Rock’s Justin Espinosa clenched his third, consecutive amateur 9-ball division title on the Poison Lone Star Billiards Tour, defeating Hiro Nakahara in the second set of the true, double elimination final, 5-0. Espinosa now joins an elite list of fellow tour players whose game has drastically improved on tour, and have graduated to the tour’s prominent “Open Division Player List”. In the open 9-ball division, an undefeated Manny Chau racked up his second win of the year, overcoming Chase Rudder in the final set, 7-2. On June 10th-11th, 2017, Bogies Billiards and Sports Bar in Houston, Texas, along with tour title sponsor Poison by Predator Cues PoisonBilliards.com, and sponsors Cyclop Pool Balls facebook@CyclopPoolBalls, Ozone Billiards OzoneBilliards.com, APA of North Harris County facebook@APANorthHarrisCounty, OutsvilleBilliards.com, and Jimmy Jenkins Realty , facilitated another successful event for Poison Lone Star Billiards Tour players. The tour would like to thank room owners David and Shannon Richardson, and their entire staff, for hosting another first-rate event. 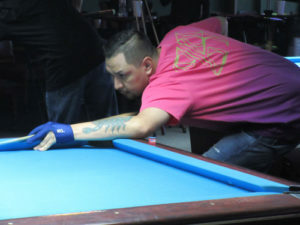 In the amateur 9-ball division, Justin Espinosa made his way to the final four winners’ side with wins over Tom Rehm, 5-1, Cody Smoke, 5-1, Robbie Salinas, 5-0, and Steve Williams, 5-2, while Jeff Chauncey ousted Will Felder, 5-3, Bill Fuller, 5-2, and Bob “Pittsburgh Flash” Guzik. Doug Gray ousted Gerald Holland, 5-4, Sonny Bosshamer, 5-2, and Robert Cooper, 5-0, while Hiro Nakahara overcame Dave DeVaney, Johnny Cope, 5-0, Robyn Haak, 5-0, and Jim McCary, 5-4. After losing his second round match to Bosshamer, 5-3, Pete Charles came back to win eight matches on the one loss side, including wins over Kevin Johnson, 5-4, Holland, 5-3, Joe Fagan, 5-3, Salinas, 5-0, and Robert Cooper. Bill Fuller terminated Vic Sorto, 5-0, and Richard Hernandez, 5-3, before falling to Jim McCary, 5-3. In similar fashion, Felder sent home Brian Rosenbaum, 5-1, newcomer Red Hutch, 5-0, and Chris Ramoz, 5-3, only to be stopped short by Guzik, 5-3. Bosshamer made his play, ending DeVaney, Chris Rocha, 5-0, and Steve Williams, rounding out the final four on the one loss side. Winners’ side action witnessed Gray fall to Nakahara, 5-1, and Espinosa surge past Chauncey, 5-3. Espinosa was on a roll, and went on to secure the hot seat over Nakahara, 5-1. Back on the west side, it was Guzik over Bosshamer, 5-3, and Charles over McCary, 5-1. Following his seventh win, Charles slid by Guzik, 5-4, but fell to Nakahara, 5-3. This turn of events pitted a rematch for Nakahara, whose only hope to win this event, was to beat Espinosa two sets. Hungry for his first tour win, Nakahara overwhelmed Espinosa the first set, 5-1. Espinosa collected himself, bearing down and winning the second set, 5-0. Congratulations to Justin Espinosa on his third, amateur division title. In the open 9-ball division, Manny Chau began his trek with wins over Kevin Johnson, 7-6, Robyn Haak, 7-2, and Brian Rosenbaum, 7-2, while Waco’s Doug Young bested Robbie Salinas, 7-2, Hiro Nakahara, 7-2, and Jim McCary, 7-5. Chase Rudder defeated Paul Alderete, 7-3, Bill Fuller, 7-1, Justin Espinosa, 7-2, and Joey Torres, 7-3, while Sonny Bosshamer took care of Adam Gomez, 7-3, Jamie Polk, 7-5, and Richard Hernandez. Following a 7-2 upset at the hands of Hernandez, Ernesto Bayaua took charge, eliminating Chris Ramoz, 7-1, Tom Rehm, and Jim McCary, 7-4. Other one loss side action witnessed Espinosa take out Cody Smoke, 7-2, David Chow, 7-0, and Brian Rosenbaum, 7-1. Nakahara was on the comeback trail, blazing through Mike Robles, 7-2, Will Felder, and Hernandez. Guzik made his bid for the final four on the one loss side, logging wins over Fuller, 7-6, Haak, and Richie Richeson, 7-3, until he was halted by Torres, 7-2. Back on the east side, Rudder overcame Bosshamer, 7-5, and Chau made quick work of Young, 7-2. Thirsty for his second tour victory of the year and anxious to regain his number one ranking, Chau overcame Rudder for the hot seat, 7-5. Back on the west side, Espinosa took out Bayaua, 7-0, and Bosshamer, 7-0. Torres tamed Nakahara, 7-6, but fell to Young, 7-6. Young went on to defeat Espinosa, 7-5, only to be put out of commission by Rudder, 7-2. It was a hot seat rematch for the two, heavy hitters. Rudder, vying for his first title of the season, faced off with Chau, who was anxious to repossess his place in the rankings. 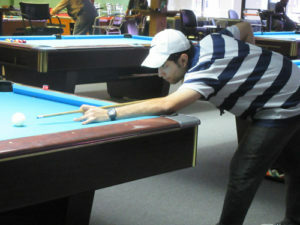 Chau was focused, and his determination bled through to the table. Rudder was controlled and concise, but couldn’t keep up. Chau closed out the first set, 7-2, taking home his second victory, and enough points to regain his throne in the open division rankings. (left to right) Hopey Carter winner of the Poison Cue Raffle, Sponsor and Realtor, Jimmy Jenkins. 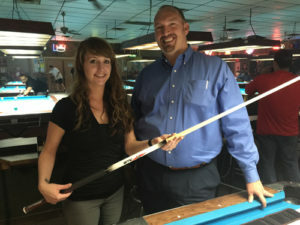 Hopey Carter from Shreveport, LA, won the Poison Cue Raffle, taking home a VX Stroke Playing Cue, valued at $239. Carter is pictured above with Realtor, Jimmy Jenkins, one of the newest sponsors of the Poison Lone Star Billiards Tour. 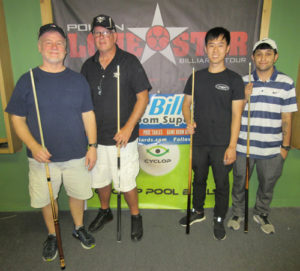 Serving pool players, pool rooms, and sponsors since 2009, the Poison Lone Star Billiards Tour celebrates its 10th Anniversary in 2018 as the longest-running billiards tour in the south. A special 10th Anniversary Event will be held for players who compete in at least two events between now, and January 1st, 2018. The tour strongly encourages all players to meet the eligibility requirements, in order to gain entrance into this one-of-a-kind tournament. The next tour stop will be held on July 7th-8th, 2017, at Fat Racks Billiards in San Antonio, Texas. This event will feature one, open 9-ball division, open to all players (limited to 64), with the option to pre-pay, online. For more information, please visit www.LoneStarBilliardsTour.com.